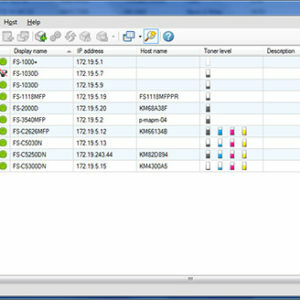 Optimise, manage and track network devices from local and remote locations. The new KX DRIVER 6 features a modern and intuitive graphical user interface, as well as new added functionalities. The driver is compatible with 32 or 64 bit versions of Windows Desktop OS XP, Vista, 7, 8, 8.1 and Server OS 2003, 2008. In addition the driver supports Windows 64 bit Server OS 2008R2, 2012 and 2012R2 and is both Windows and Citrix Certified, ensuring a smooth installation on the server and connection with the user’s PC. 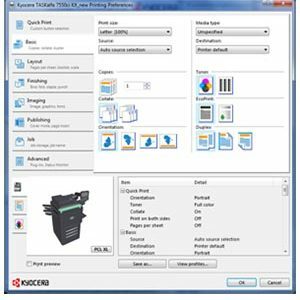 KYOCERA Net Admin is Kyocera's unified device management software that uses a web-based platform to give network administrators easy and uncomplicated control to handle a fleet for up to 5,000 devices. Tasks that used to require multiple programs or walking to each printer can now be accomplished in a single, fast and modern environment. 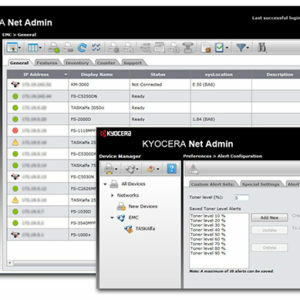 KYOCERA Net Viewer 5 is KYOCERA’s network device management software for small and medium sized businesses. Offering counter readings, status feedback, remote device configuration, accounting and alerts of network devices at one central administration point, it is powerful yet easy to use.